Evolution is too often referred to in the past tense. Author Juan Enriquez and erstwhile Harvard researcher Steve Gullans remind us, in Evolving Ourselves, that not only is evolution still churning away today, but humans have become major forces in the process by dint of our massive impact on the rest of the biosphere and on our own health and longevity. By diagnosing and accommodating individuals with severe food allergies, for example, we’ve enshrined a trait that was often fatal—and, therefore, rare—a mere three centuries ago. Rather than bemoaning humanity’s impact on natural selection, Enriquez and Gullans celebrate the potential to further alter our evolutionary course utilizing the modern marvels of biotechnology. Not coincidentally, the authors are also cofounders of Excel Venture Management, which invests in start-ups specializing in synthetic biology, big data, and new genetic technologies. Life’s future is now firmly in our hands, they write, but only if we apply our increasing scientific knowledge with wisdom and foresight. Rob Dunn, the North Carolina State University biogeographer and popular science author, is back with The Man Who Touched His Own Heart. 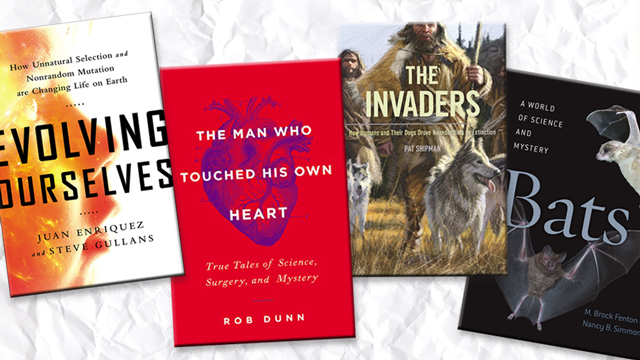 In his latest book, Dunn explores the history of humanity’s centuries-long curiosity about this vital organ, from ancient civilizations that considered the heart the seat of the soul to researchers and clinicians of the modern era working on the fringes of experimental medicine to explore the mysteries of the circulatory system’s workhorse. The book reaches its most dramatic heights as Dunn relates the story of his titular hero, Werner Forssmann. In 1929, the 25-year-old German physician sat at a bar one night and had an idea that would end up revolutionizing medicine. Forssmann hypothesized that it would be possible to send a catheter to the heart through a major vein or artery and obtain an image of the living organ in patients. His supervisors were dead set against the young clinician experimenting on humans, so Forssmann tricked a nurse into helping him perform the procedure on himself. He eventually obtained an X-ray of his own heart, an image that would win him a share of 1956’s Nobel Prize in Physiology or Medicine, much to his own surprise. With the engaging prose that has become his trademark, Dunn plumbs the depths of the heart, through the eyes of the ancients, early researchers, and contemporary scientists. Blink, and you may miss almost a quarter of Earth’s mammalian species. As they flit in and out of the shadows, bats live relatively secretive lives, but the roles they play in ecosystems that span the globe are hard to miss. From pollination and insect control to seed dispersal and soil improvement, more than 1,300 species of the flying mammals yield some of their secrets in Bats: A World of Science and Mystery, from bat researchers M. Brock Fenton and Nancy B. Simmons. Alongside vivid photographs of bats flying, mating, and feeding, Fenton and Simmons explain the intricacies of the animals’ ecology, behavior, and physiology. Above all, the book is a call to conserve bats, as encroachment and hunting threaten their habitats and populations. More than half of the world’s bat species are in decline or already classified as endangered. Europe 45,000 years ago was a battlefield of epic proportions. As bands of Homo sapiens arrived on the continent after departing their evolutionary birthplace in Africa, they encountered Neanderthals, a hominin species descended from groups that had migrated from Africa as much as a quarter of a million years earlier. In short order, Neanderthals disappeared from the landscape, while the more recent arrivals thrived. One of the keys to the newcomers’ victory? Their canine companions. The particulars of the story can only be conjectured, and ancient DNA evidence has suggested that we assimilated, rather than subjugated, Neanderthals. But in The Invaders, Penn State anthropologist Pat Shipman draws upon data from the field of invasion biology to build a case that modern humans were a major factor in the demise of our Neanderthal cousins, with a lot of help from our hunting partners, domesticated wolf-dogs. Our canines may have given us the much-needed edge in hunting down Ice Age mammals, which fueled our bodies and expanded our populations, Shipman argues. The book lays out a compelling argument not only for the importance of canine domestication in the rise of our species, but for how befriending dogs shaped our minds and mentalities as we advanced into the new age of Homo sapiens dominance.